On Tuesday, Şükrü gave a talk in our groups and combinatorics seminar on material related to last week’s discussion. The slides of his talk are available on our seminars page and include a definition of a Phan system. Alice Devillers led the discussion in the study group on Friday to give a buildings perspective on last week’s discussion by Şükrü. Recall that a chamber system consists of a set of chambers such that two chambers are -adjacent if they agree in all but their elements of type . See also this earlier discussion. We say that a chamber system is simply 2-connected if every closed path can be reduced to the trivial path bya sequence replacing any subpath lying in a rank 2 residue by another path in the same residue, that is, any closed path is 2-homotopy equivalent to the trivial path. Buildings are simply 2-connected chamber systems. This week Alice is leading the discussion and the topic is buildings. We begin with an example. Let and . Also let V be a 4-dimensional vector space with basis . We can form a tetrahedron with vertices labelled by . We place vertices at the midpoint of each edge (these each represent the 2-dimensional subspace spanned by the two 1-spaces at either end of the edge) and a vertex at the midpoint of each face (these represent the 3-spaces spanned by the three 1-spaces at each corner of the face). 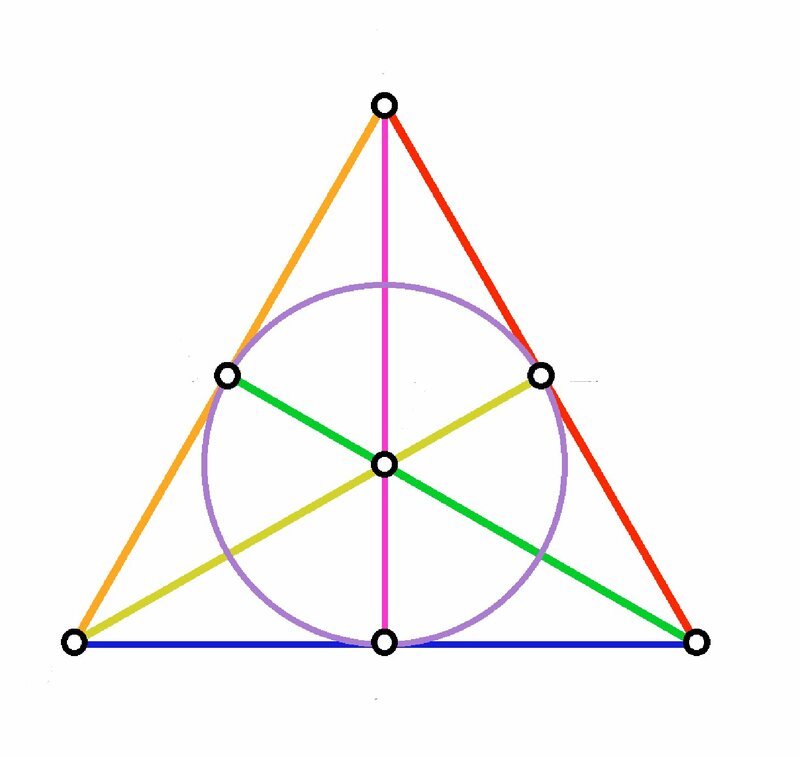 This gives us a simplicial complex whose 0-simplices are the vertices, the 1-simplices are the lines between 0-simplices, and the 2-simplices are the parts of faces surrounded by the 1-simplices. Now W acts on V by permuting the basis elements. Let I be the 2-simplex surrounded by the vertices . We can associate each of these three vertices with the subgroup of W generated by the two elements of S which fix the associated subspace. That is, is associated with , is associated with and is associated with . The 1-simplices joining these vertices are associated with the intersections of the subgroups associated with the end vertices, while we associate I with the identity subgroup. Now for each other simplex we can associate a coset of the appropriate simplex in I. In general, given a Coxeter system we can form the Coxeter complex which is the poset on the set and if and only if . There was much discussion as to whether or not S needs to be a simple system but this wasn’t resolved. (B2) If both contain simplices then there is an isomorphism fixing and pointwise. Taking and applying (B2) implies that all apartments are isomorphic.